BELOW: A biglietteria or ticket point near the Piazza San Marco. Venice's vaporetti or water buses are operated by ACTV, the local transit authority. To ride them, you'll need a single-fare ticket, a Tourist Travel Card, a VeniceConnected tourist pass, or--for extended stays--the VeniceConnected long-term stored-value card. Most tourists buy ACTV single-fare tickets or Tourist Travel Cards (which offer better value than the standard ticket, if you plan your boat trips to maximize your savings during the 12-hour to 7-day validity of your travel card). From an ACTV or Hellovenezia ticket outlet. You'll find a biglietteria or "ticket point" at most larger vaporetto stations, such as Piazzale Roma, Ferrovia (along the water by the railroad station), Rialto, San Marco Vallaresso, and Zaccaria (on the waterfront above the Piazza San Marco and the Doge's Palace). Business hours vary, but if the ticket point is closed, you can use a machine. To avoid lines, you can also buy tickets and passes from many tobacco shops and newsstands. 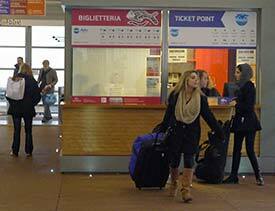 With the AVM Venezia app, which lets you buy and validate tickets with your Android or iOS smartphone. But read our AVM Venezia app article before taking the plunge. Tip: The old cardboard ACTV tickets have been replaced by rechargeable tickets such as the biglietto ricaricabile shown here. If you pay for two or three tickets at a newsstand or ACTV ticket counter and you're handed only one biglietto, don't worry--several fares are stored on the ticket, and you can present it for recharging when you want to buy more fares.